The NEW “ULTRA SOURCE” retains all the advantages of the original Sloan E-Beam source, large hearth capacity, high deposition rates, long filament life, and industrial reliability, but has been re-engineered. There is no need to disconnect water fittings when disassembling the source for routine maintenance. All wear surfaces are now stainless steel instead of copper. Water leaks caused from removing the hearth have been eliminated. Already have an original Sloan Multi-Pocket E-Beam Source? 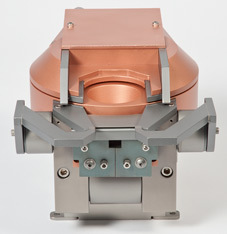 The ULTRA SOURCE shares many of the same components as the original Sloan source – expendables, magnets, anodes, beam formers, filament blocks and many other parts are all compatible.